Tap symbols for info. Tap for Full-Screen. This map shows accommodation for Bozí Dar. To locate Hotels and Chalets elsewhere, tap a marker or select a link from the menu to switch maps. Check availability and prices for Chalets and Apartments in Bozí Dar. Offering views of the mountains, Apartments Stein is set in Boží Dar. Skiareál Neklid is 400 metres away. Free WiFi is provided and private parking is available on site. All units have a seating area. Situated in a quiet part of Boží Dar, close to cross-country skiing tracks and a local bog, Apartmány Engadin offers a self-catering accommodation with free WiFi, 250 metres from teh Oberwiesenthal Ski Area and Kids' Park. 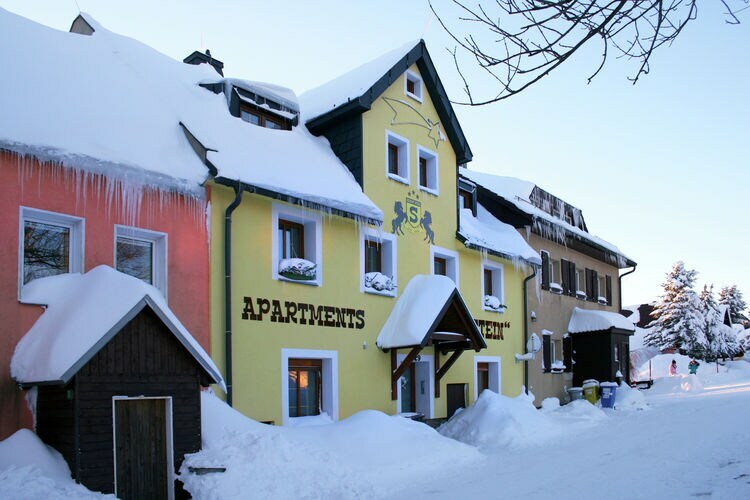 Situated at the Baby Jesus Trail in Boží Dar and 200 metres from the Novaco Ski Lift, U Tří smrků offers fully equipped apartments with free WiFi and ski-to-door access, 50 metres from the town square. Located in the centre of the village of Boží Dar, Casas Confort is a modern, self-catering accommodation and offers rooms with panoramic views of the Špičak Mountain, free WiFi and free private parking. Surrounded by woods and green pastures, Apartmány Cestář Boží Dar enjoys a quiet location, 50 metres from the Praha Ski Lift. It features self-catering apartments with floor-heating and free Wi-Fi. Beautiful apartment in Boží Dar in the result on the German border. The apartments - studio "s Stein are located in the center of the village Boží Dar in a renovated house. Wednesday 26th June 2019, 7 nights, Self Catered. Tuesday 27th August 2019, 7 nights, Self Catered. Located in Boží Dar, just 400 metres from Novako, Apartmány BD Boží Dar features accommodation with free WiFi. The property is 2.1 km from Klement and 800 metres from Skiareál Neklid. Situated in Boží Dar, Apartmány Na náměstí provides accommodation with a seating area and a kitchen. Complimentary WiFi is available. Each unit is fitted with a microwave, toaster, a coffee machine, as well as a fridge and kettle. Located 200 metres from Novako and 2 km from Klement in Boží Dar, Apartman Bozi Dar offers accommodation with a kitchen. The property is 700 metres from Skiareál Neklid and 4.4 km from Skiareal Klinovec sever. The apartment comes with a TV. Apartments in Bozi Dar/Erzgebirge 26871 is situated in Boží Dar. Featuring private parking, the apartment is 200 metres from Novako. The apartment is fitted with 1 bedroom, a TV and a fully equipped kitchenette that provides guests with a dishwasher. Chalets and Apartments in other popular Ski Areas near Bozí Dar. Piste and Lift Stats for Bozí Dar, Czech Republic. Common questions about Bozí Dar. Note :- Ski Accommodation deals to Bozí Dar are subject to change until booked. You must check any particular requirements directly with the Operator at the time of booking. Warning :- Snow Sports are Dangerous! Skiing, snowboarding and all winter sports involve risk of serious injury or death. You MUST confirm all information, especially snow and weather conditions, in Bozí Dar before you ski or board. You participate at your own risk.